Two LayerFruits and flowers range is a unique combination of two metal caddies, the top caddy containing a blend of Ceylon black tea or green tea with colourful petals, flavours and slices of natural fruits, while the bottom contains natural Ceylon black tea or green tea without additives. A delightful treat to suit the individual palates of the discerning tea drinkers for a pleasant tea drinking experience. Top caddy with 50g of loose/leaf tea and bottom caddy with 75g of loose/leaf tea. All loose leaf teas are packed in flavour-sealed foil pouches with zipper lock. "Fruit and Flowers" Tin Caddies 70254 English Rose / Dimbula 2 caddies in 1 unit 125g tin The top tin carry black loose/leaf tea with natural rose petals and rose flavour - 50g. The bottom tin carry black loose/leaf tea from the Dimbula region -75g, no additives. Produced & Packed in Sri Lanka Rose tea is preferred for its aroma as its name may suggest and with the addition of rose petals means a lighter and more subtle taste, with a hint of sweetness and a stronger aroma. This combination creates a mesmerizing tea blend which offers an aroma that feels like you just received a dozen of roses from a loved one.From the misty mountains of Ceylon's western slopes comes this exquisite leaf. 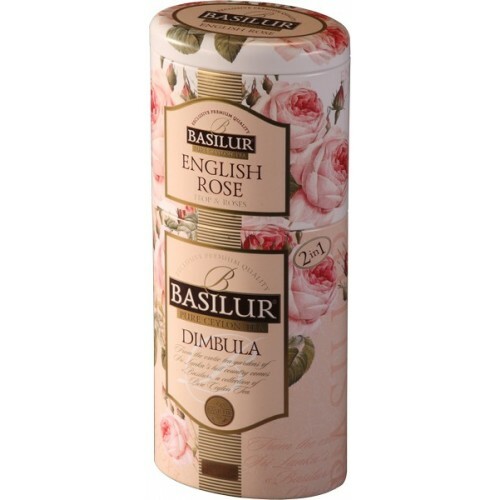 Traditionally known as Ceylon's answer to a perfect English tea, Basilur Dimbula tea is a golden colour with a delicate flavour and unique bouquet to make this one of the world's finest.